The main argument from the 9/23 Rapture Cult is that this sign from Revelation 12:1 is the rapture. Some have even back pedeled away from it and make the claim that if the rapture doesn’t happen on September 21-23 then it will happen by the first of October or by December 1st. Some have even said that it could be the start of their “7 year tribulation”. I disagree with all those theories. I’ll say it a million times, its not a good sign and its an occult event only to decieve Christians. They look at all kinds of disinformation and will continue to disregard the actual Greek text and wording of scripture. One particular person who has commented on my original post continued to say prophetic literature was written in different tenses and moods in the Greek but refuses to explain what he means and answer my main point. That being…Why would John use one specific form of a word that was in the Passive (Past Tense as he saw it when writing it) form and use the same word in a different form in the following chapter as Active (something Future and continuing at the time he wrote it)? Let’s look at the Greek of these verses. Below is from the Recieved Text or Textus Receptus of 1550. This stream of Greek is where we get the KJV. In contrast to this text is the Tischendorf 8th Edition where he translated from the Sinaiticus. Tish found this text in the trash at a Greek Monastery. Wescott and Hort and Nestle and Aland used this text along with many others to get modern translations like the NIV and many others. In order for one to believe that the Revelation 12:1 & 3 signs are for a future event, one would need to stick to Tischendorfs Sinaiticus manuscript which falls right in line with the Vatican made “rapture” theory. Below we see verses Revelation 12:1 & 3 in regards to what John SAW or should I say was seen ie passive ie past tense. Underneath these verses is Tischendorfs falsified documents. As you can see, John used ὤφθη ((ōphthē – was seen) as a Aorist Indicative Passive in the 3rd person in the Textus Receptus manuscripts. Matter of fact, almost every Greek text used this same word except for Tischendorfs 8th Edition from the Sinaiticus. He used ὁράω which is in the Indicative Active and is actually the root word horaó. The way he wrote it was in the Future tense and the Vatican Jesuits loved it. In all of the other manuscripts, including W&H’s blasphemous texts, it was passive. This is where these texts got it right for once. Now if John wanted to use this word for something seen in a future or active tense for the Greek, he would’ve wrote the word in a active future tense or a future tense. The active future tense of this word for “seen or saw” looks like this, εἶδον (eidon). Ironically John did use the future active tense of this word in Revelation, and he used it 45 times. The active future form of this word εἶδον was used 45 times compared to ὤφθη, the passive or past tense form used only 3 times. Now I need to correct something on my last paper on this. According to the W&H, Nestle and other texts, this word εἶδον (eidon) is used in Revelation 13:1. Tischendorf still uses ὁράω. The problem with this is that these mentioned manuscripts completely leave out the opening sentence in 13:1. Καὶ εἶδον ἐκ τῆς θαλάσσης θηρίον ἀναβαῖνον, ἔχον κέρατα δέκα καὶ κεφαλὰς ἑπτά, καὶ ἐπὶ τῶν κεράτων αὐτοῦ δέκα διαδήματα, καὶ ἐπὶ τὰς κεφαλὰς αὐτοῦ ὀνόματα βλασφημίας. So these other manuscripts leave out a sentence all together and the word for saw, εἶδον (eidon) is used in the active future form. Something that would be present in John’s day that would continue into the future. That should put to sleep a future 1st and 2nd beast theory…but it won’t according to some. The actual true Future tense of the word for this same word for “seen or saw” was used by John a few times in Revelation. You can see it in Revelation 1:7 the Future Indicative Middle tense of ὄψεται (opsetai). Its also in Revelation 22:4 with ὄψονται (opsontai). These two words are used for Jesus’ second coming for a future time. The Greek wasn’t foriegn to John when he wrote this word for something he saw in a dream or vision whether it be for a future time or something in the past. It was either past tense with something that happened prior to him seeing what he saw or it was something active while he was writing Revelation and continuing or for the a future event at the time of him writing Revelation. All of these words come from the root word horaó. John clearly knew how to differentiate between something that happened in the past, something that was actively happening and would to continue to happen in the future and something that was strictly for a future time. 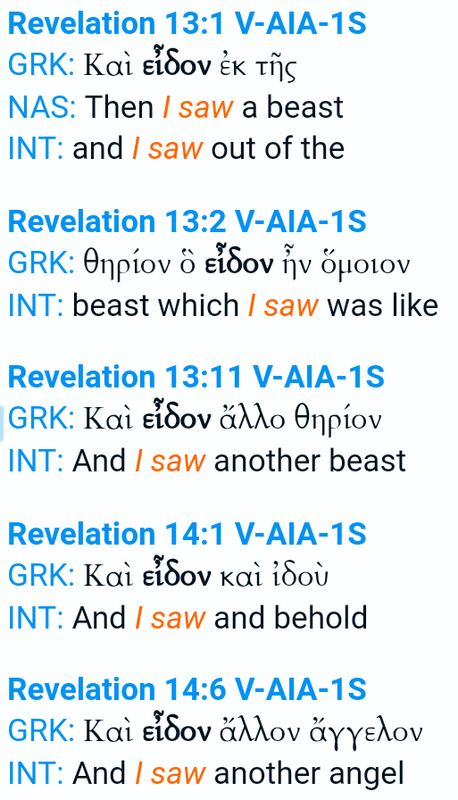 According to the Greek text, Revelation 12:1,3 was based off of something that had happened in the past. If John wanted to say that the Revelation 12 signs were for a future event then he would have used either ὄψεται of Revelation 1:7 or ὄψονται in Revelation 22:4. He didn’t. That’s why Revelation 12:1 is the birth of Jesus and not some “rapture” of the Church. To believe its for a future time and the “rapture” of the church then you need to follow the corrupted Sinaiticus and the Vatican. Which they do.